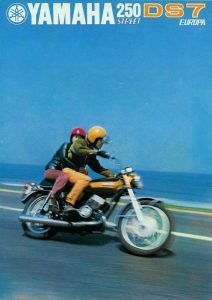 A new series where Classic-Motorbikes.net looks back at the machines enjoyed by those of us now in our 50s. What made them memorable and why we loathed or lusted after them? Two things you may not know about the RD family; firstly, a Russian ballistic missile motor (RD250) developed in the 1960s shares the name (most appropriate) whilst more worrying is the North Koreans may have the same rockets today. Strangely, the RD 250 was always associated with the ‘uncontrollable wild-child’ (Kim Jong-un) more generally spotty nutcases from the 70s. Second thing you may not know is I had seven in various states of ‘brokenness’! There was a time when you could purchase your very own planet destroying, smoke trailing, super quick Japanese bone breaker for a few hundred quid…and I did. Whilst the neighbours may have hated me, they always knew when I left for work; ahh ‘I love the smell of two stroke in the morning’. Riders of 70s Arrrh Dees could be considered the Millwall fans of motorcycling ‘No one likes us…we don’t care’. The RD story can be traced back to 1957; using the code YD1 Yamaha’s first 250cc was based on the German Adler 250 from 1949. The design was the first post war offering from the Adler but as part of wartime reparations BSA took many of its features for the Ariel Arrow and Leader ranges. 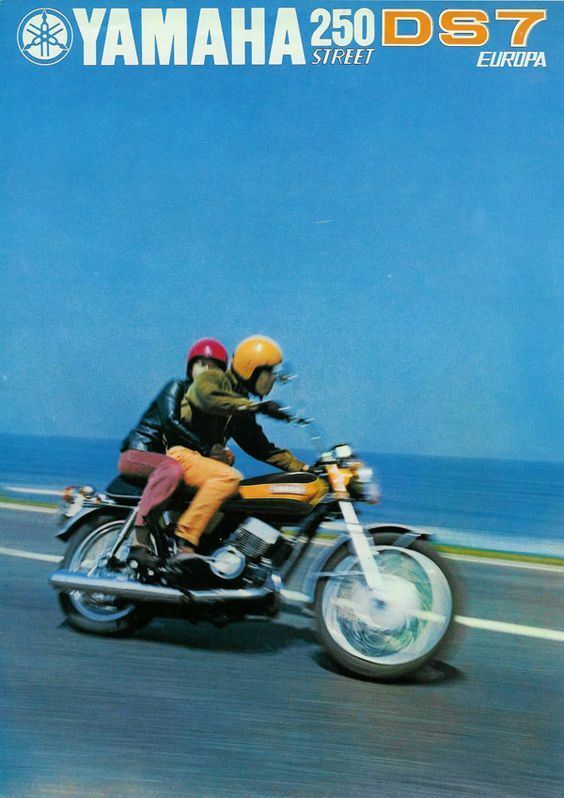 During the mid-50s Yamaha took their chance to develop the YD1 and it first hit the race track in 1958 at the Catalina Grand Prix…a sixty mile on-off road event which proved an ideal testing ground for many manufacturers. 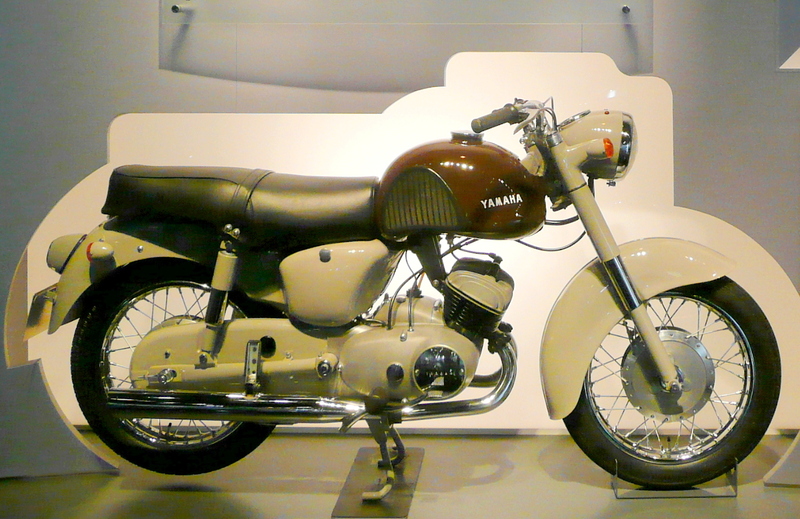 The road version of the YD1 enjoyed 247cc with single carb and offered 14.5hp (later versions were improved to 18hp) from an air cooled parallel twin. Yamaha entered its first World GP in France summer 1961, the same year they sent a team to the Isle of Man and scored a sixth-place finish. 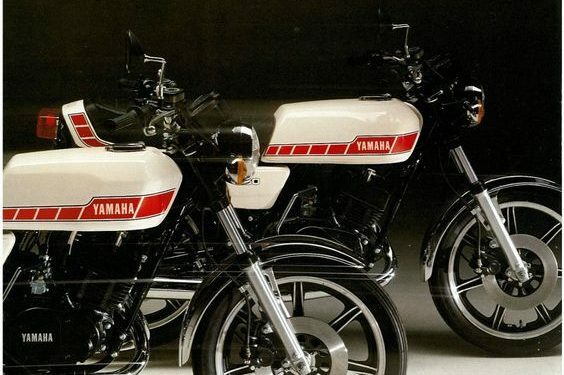 The YD2 arrived soon after with electric start which was smartly followed by their export market hero; the bikes that really put Yamaha on the worlds motorcycle map, the YDS1 & 2. Legendary pilots raced for the marque in 1963 including Read, Redman and Agostini, the same year their unique ‘Auto-lube’ system was unveiled at the All Japan Motor Show. With a larger race programme and a development machine called the RD56 they took second and fourth in the 250 class at the Isle of Man in 1963 before winning the same class but at world championship level in both 64 and 65. 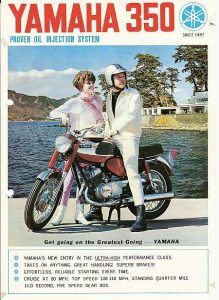 The road 350cc named the YR1, which was never actually sold in the UK, arrived in 1967 and boasted 36.5hp; this machine set the benchmark for all Yamaha two stroke twins to follow. 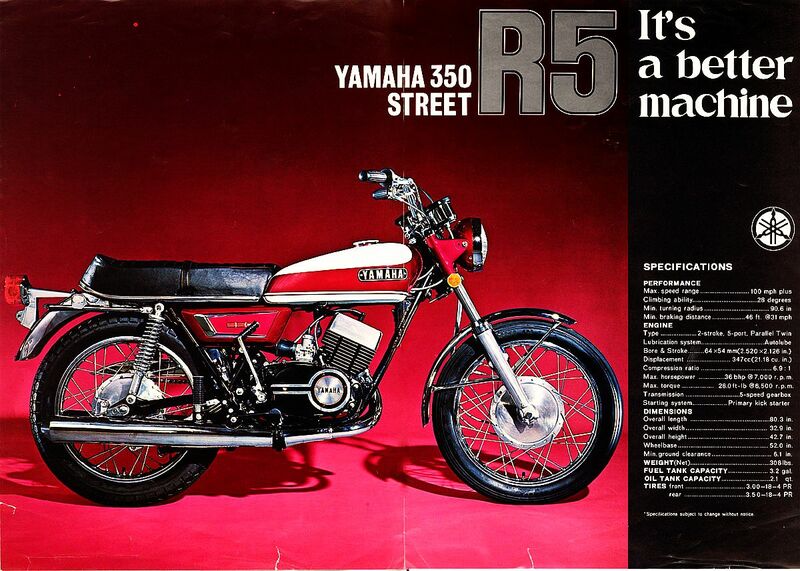 With 100mph plus with a standing ¼ of 14 seconds it’s no surprise that each year the upgrades were slight and the YR2 & 3 models ran until 1970 when the pre- RD first hit the showrooms; the R5. 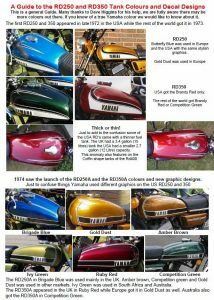 Sleeker and faster than all previous Yam two strokes and when tested by Cycle World for the first time in 1970 the conclusion was ‘The R5 offers substance as well as appearance. Within limits it will do things most of the more expensive super-bikes will do, at lesser cost but equal fun value’. 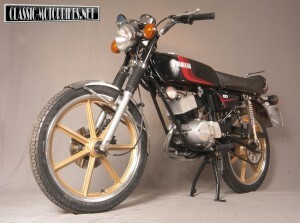 In the UK we had the pleasure of the YDS7 in ‘71’ with 30hp from 247cc and due to the gearing could scream up to 7500rpm but ran out of puff around 90mph; which was probably fast enough running with drum brakes. 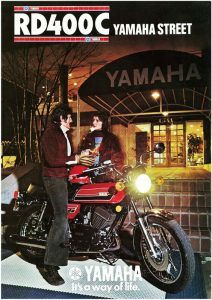 The all-consuming RD range from 1973 allowed Yamaha to settle into a decade of constant upgrades and great sales figures. 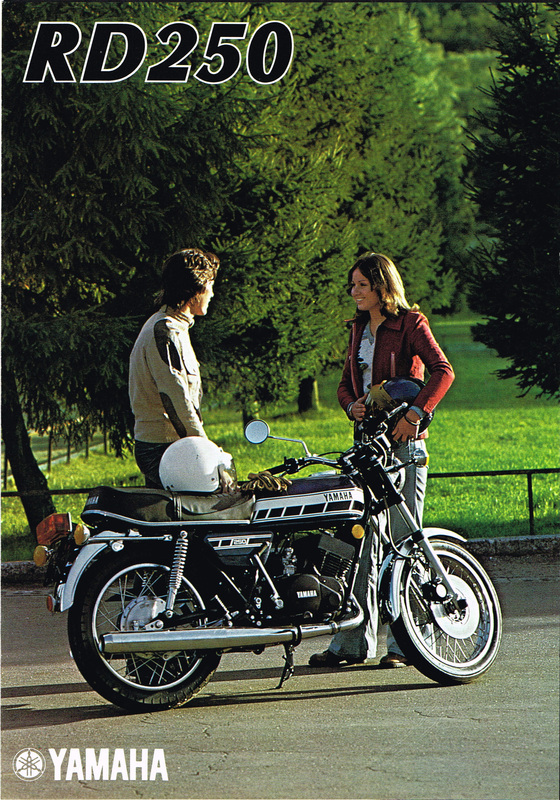 The ‘Elsie’ model took the brand into the 80s and will wait for another day (worthy of its own feature) but the air cooled 250s received a styling transformation in 76 and was joined by the mighty 400. The ‘Coffin Tank’ version enjoyed star status and became my bedroom pin up poster, replacing the Lambo and the girl scratching her arse on the tennis caught. 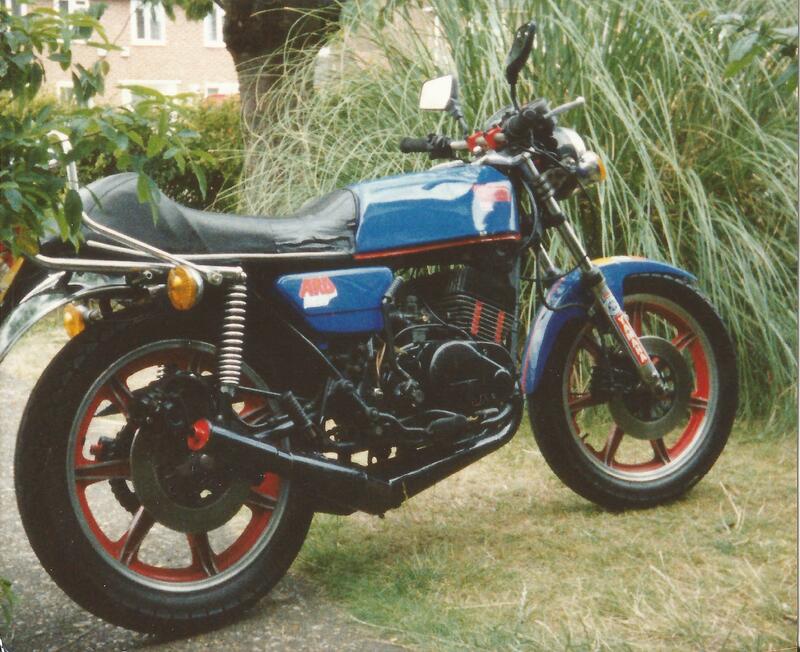 It was the bike of my dreams and became the bike that dominated my garage many years later. 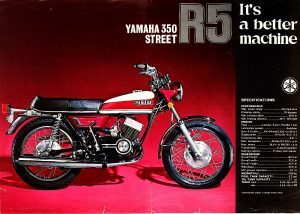 Drums stopped the very first of the RD250’s in 1973, often referred to as the ‘A’ but this was quickly revised; the single disc was just one of the items Yamaha raved about in their promotional material. The superb sounding seven port ‘Torque Induction’ will be remembered by those of a certain age group; the decal on the side panel proudly proclaimed its existence. Seven ports? It’s an odd number, so Yamaha explains ‘the important seventh port functions both as an intake and scavenging port, increasing vital engine breathing’. This evidently gave the rider instant and outstanding acceleration just like Yamaha’s Grand Prix machines; slightly OTT but you get the picture and to a 17-year-old this information was of biblical importance. The 250 came with reed valves, something I can recollect swopping for fancy aftermarket versions that managed to make the bike actually go slower. The five-speed constant mesh transmission was praised for its quality, considering the abuse they suffered mine still performed as it should even minus a few teeth. Yamaha describe their forks as exciting, in fact they were ok, as were the rear shocks but most agree the double cradle frame excellent for the era. The change to single disc on the front was an improvement, although the RD stoppers were always rather wooden they did the job; unless you were in an awful hurry to stop! Motorcycle World said on their front cover Jan 1973…Yamaha RD 350, 6 speeds, reed valves and a disc brake. What more could you ask? 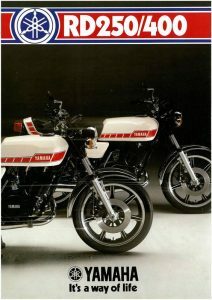 Whilst Bike Magazine in June 1975 went all out with an eight-bike head to head; featuring the Kawasaki S1, Suzuki GT250, Honda CB250 plus ¼ litre machines from Ducati, Harley, CZ, MZ and the RD. Page after page of testing confirmed what history has repeated; the RD was the fastest but only achieved joint first with the Kawasaki due to poor handling, mainly caused by the factory fitted Bridgestone Nylon Tyres. 60mph came up in 8.9 seconds with a standing quarter mile ticked off in 15.75 seconds. The price for all this performance in 1975 was £515.00 on the road. The following year the same team performed a five bike 400cc test; the coffin tank had arrived but the competition had also improved. Kawasaki’s KH400 and Z400 lined up against Honda’s superb CB400 and the mighty GT380 from Suzuki, all faced off against the new RD. Yamaha put a lot of effort into getting the 400 just right; Dunlop tyres, rear disc brake and improved handling; speed was obviously there in spades. Fastest ¼ mile and 103mph straight out of the crate with the all new alloy cast wheels for only £675. 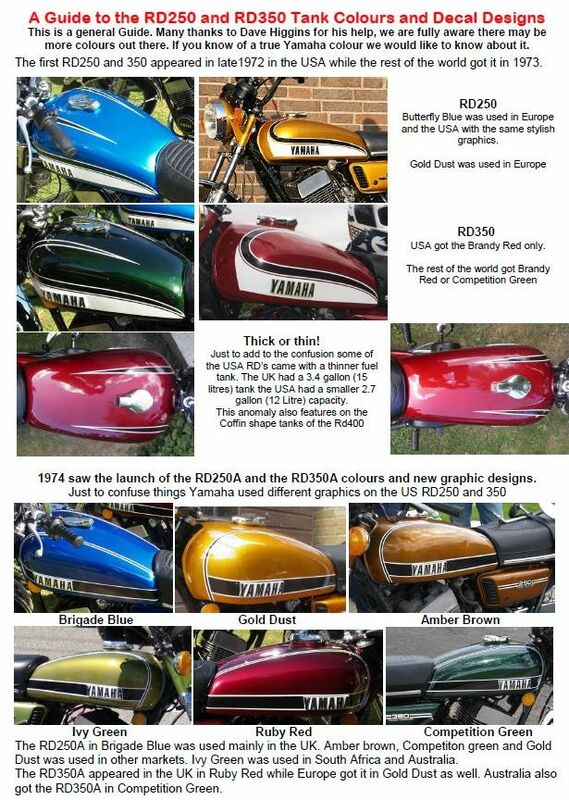 The RD400 was voted pick of the bunch against a selection of machines the testers confirmed were worthy opponents for many of the era’s 750cc choices. 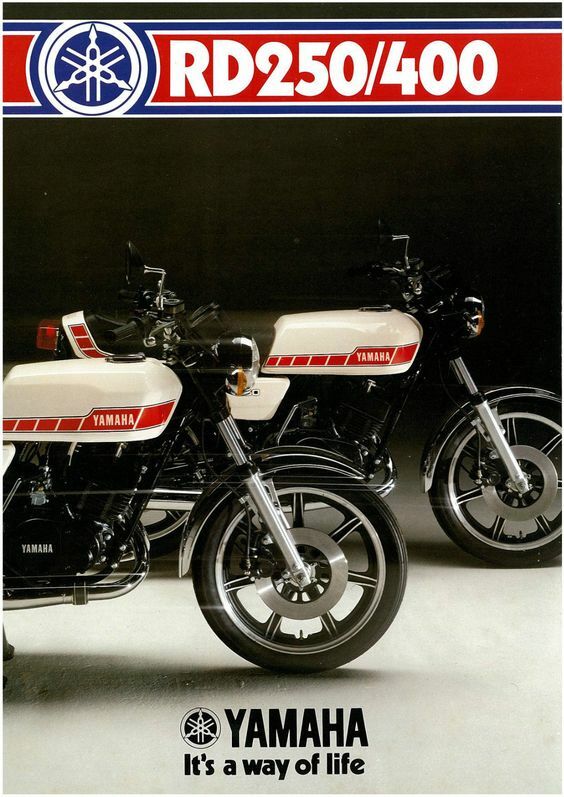 The RD in both 250 and 400 had laid down the standard other manufacturers would chase but ‘time waits for no man’ especially when emissions laws ‘Stateside’ were being strengthened against the total burning power plant. The Americans at Cycle World received the ‘E’ version in November 1977 and led by asking if the end of the larger 2 stroke was nigh? 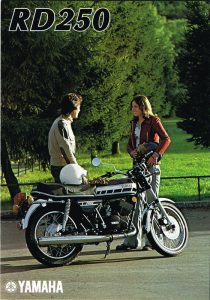 They concluded the RD400E was so good it would be around for several more years, they were only half correct as the LC was coming and the air-cooled motor was on borrowed time. 70s tearaway Gary James, bike shop worker in-period, either owned, borrowed or blagged all of the era’s two wheelers…He always shares an opinion, whether we like it or not! 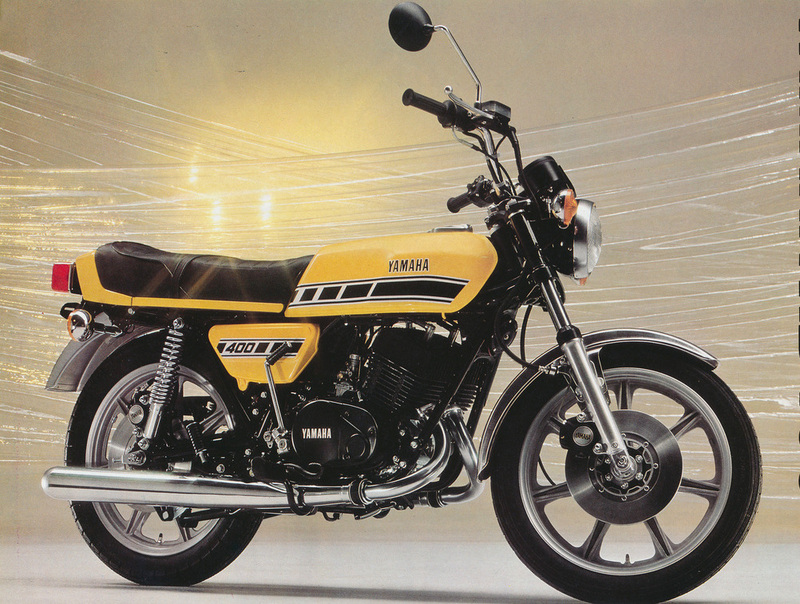 He thinks…Yamaha’s RD…Great handling with poor brakes, a well worked design that made for decent everyday usable transport. Surprising performance that allowed 17-year-olds to blow away pretty much any car driver; quite often an accident waiting to happen. In 1983 the change in learner laws from 250cc to 125cc killed off the ¼ litre market, although the two stroke was already in decline. The ‘coffin tank’ model ‘E’ was the last hurrah for those machines cooled by on-rushing air. Once the Elsie arrived, a whole new world opened up but not for your average acne suffering British 17-year-old, they now had to face the DVLA’s testing officer. Just when we thought it was all over the sub-continent joined in the fun…a collaboration between Yamaha and India’s Escorts Group produced the Rajdoot RD350. 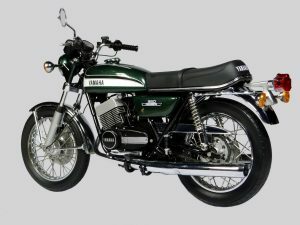 A modified version of the round tank 350B was de-tuned for the Indian environment nearly a decade after it first stopped motor show crowds in Japan. The ‘Hi Torque’ version was available initially in 1983 then de-tuned further two years later for fuel efficiency. This was the ‘Low-Torque’ model and was still available brand new in 1989! 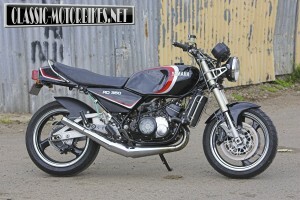 For riders of a certain vintage the RD series has without doubt more nostalgic memories than great biking achievements. Looking back through rose tinted or ‘blue hazed’ glasses for those who graduated from the SS or FS1E it was monumental; or maybe just metal. ‘Warp speed please Mr Yamaha’ and when the revs reach the required point you held on tight. For many the RD was the one bright spark in a time of industrial strife, poor fashion and a rubbish top twenty. In a decade that had more than a fair share of drab, the RD offered escape from the norm, like many I learnt that there was only one Barry Sheene and I wasn’t him. I managed to annoy just about everyone over 21 and formed a partnership with a Japanese motorcycle that was still strong a decade later. For me, like many, the legacy of Yamaha’s RD is personal and I wish one still frequented my garage, whilst that acceleration rush is ingrained in the memory and that distinctive engine note will still stop me in my tracks.